Ultracapacitors, energy-storage devices that absorb and release charge in minutes, could be a rapid-charging, cheaper, and safer alternative to batteries for electric cars. But commercial ultracapacitors can hold just 5 percent of the energy of lithium-ion batteries, providing short power bursts that limit them to uses such as acceleration in hybrid buses. Researchers at Nanotek Instruments in Dayton, Ohio, have now made graphene electrodes that could lead to ultracapacitors with more than five times the energy density of commercial devices. By using graphene--atom-thick sheets of carbon--Nanotek increases the surface area of the electrodes in the ultracapacitors, boosting the amount of charge that they can store. "We are trying to bridge the performance gap between an ultracapacitor and a lithium-ion battery," says Nanotek's Bor Jang, the lead author of a paper published in the online version of the journal Nano Letters. The company's tests of a coin-sized ultracapacitor cell show that the graphene electrodes could store 85.6 watt-hours of energy per kilogram. Since an electrode typically weighs about one-third of a full-size ultracapacitor, a practical device would have an energy density of around 28 watt-hours per kilogram, Jang says. By comparison, today's ultracapacitors have densities of 5 to 10 watt-hours per kilogram, while nickel metal hydride batteries and lithium-ion batteries boast 40 to 100 watt-hours per kilogram and over 120 watt-hours per kilogram respectively. However, batteries are typically operated in the middle range of their full charge cycle, often using only about 20-50 percent of their total charge capacity, says Joel Schindall, an MIT electrical engineering and computer science professor. This means that an ultracapacitor with about 20 percent of the energy density of a rechargeable battery, but with a rapid recharge time and almost unlimited lifetime should be competitive for some electric vehicles. What is more, while the chemical reactions that charge a battery take hours and degrade the electrodes after a few thousand cycles, ultracapacitors charge in minutes and can last millions of recharge cycles because they store charge electrostatically—ions from an electrolyte in the capacitor cling to the electrodes' surfaces. 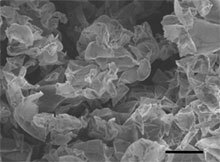 Commercial ultracapacitors have electrodes made of activated carbon, a highly porous material that stores ions in its pores. Graphene could store much more charge because ions can form a layer on the carbon sheets; the charges should also be easier to get on and off the surfaces. However, current methods to make graphene result in flat graphene flakes that overlap, so the surfaces get covered. The Nanotek team has discovered a way to make sheets that don't stack face-to-face but instead resemble crumpled sheets of paper, exposing much more of the surfaces. Jang says that the coin-sized test cells lose less than 10 percent of their charge storage capacity after being recharged 500 times. Improving the electrode materials should increase the cycle life, he adds. Dileep Agnihotri, the CEO of Graphene Energy, a graphene ultracapacitor startup based in Austin, Texas, says that his company has achieved similar energy densities with a better cycle life. Its cells lose 3 percent of their charge storage after 10,000 cycles. "We are in the range of lead-acid batteries with a charge-discharge every second," he says. Meanwhile, FastCAP Systems, a spinoff based on technology developed at Schindall's lab, is making ultracapacitor electrodes with vertically grown arrays of carbon nanotubes. Schindall says the company has already achieved energy densities of 20 to 25 watt-hours per kilogram. The target is 25 to 30, and it should be at least two years before FastCAP can deliver a market-ready product. Schindall says that the new graphene energy densities are impressive. To compete with batteries, though, all of the carbon nanomaterial technologies for ultracapacitors face the challenge not only of improving energy densities but also of making electrodes that perform well consistently on a large scale.